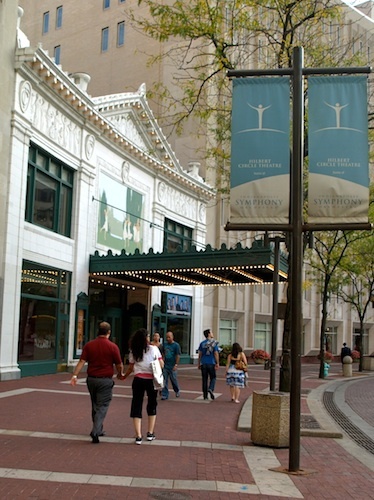 On Friday evening the show moved into Indianapolis's Hilbert Circle Theatre for the finals of the International Violin Competition of Indianapolis. And here is the Hilbert Circle Theatre, right on that circle. Beautiful outside and in! 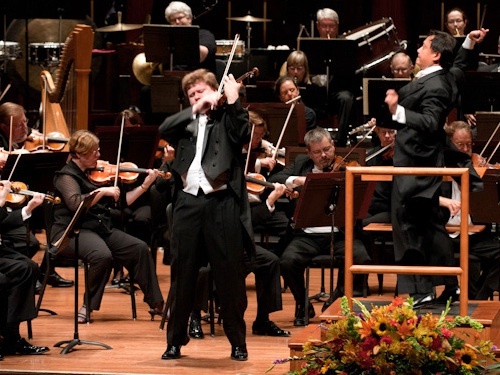 On Friday we heard performances of the Tchaikovsky Violin Concerto by Andrey Baranov, 24, of Russia; the Bartók Concerto No. 2 for Violin by Antal Szalai, 29, of Hungary; and the Beethoven Violin Concerto by Clara-Jumi Kang , 23, of Germany/South Korea. After hearing quite a lot of Mozart over the last few nights, I enjoyed the chance to hear three very different concertos, all in one night. 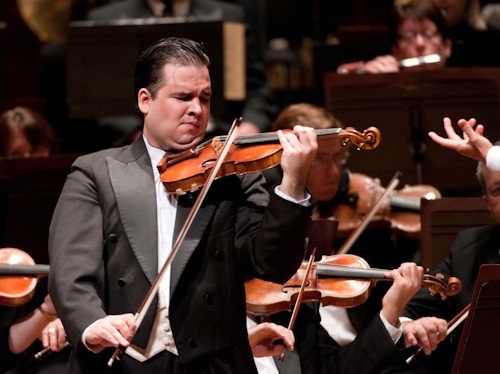 Andrey Baranov gave himself no breaks in the physically exhausting first movement of the Tchaikovsky Concerto. The movement basically goes: big, long, technically demanding exposition...cadenza...mirror-image big, long, technically demanding recapitulation. A few stumbles at the end let me to wonder if he ran out of steam. But if that was the case, one would never have known it in the second or third movements. I loved his second movement, with his steady and singing bow arm paired with an articulate left hand, which seemed to savor every trill and make it so clear. It was just so well-enunciated, without detracting from its musicality. In the last Indianapolis competition (which I did not attend) there were apparently quite a few contestants playing Bartók's Concerto No. 2, but for this one, Antal Szalai is the only one, and that made it a treat. What a mammoth and complex work, and he really nailed down all the details. In the first movement I noticed that he had good direction, like he was directing the flow, and I enjoyed the effect made by his waves of runs. This piece has so many right angles – fast transitions into a new and different gesture, and Antal was able to switch gears well. In the second movement I noticed how perfectly in-tune was the section that was sans vibrato – so much more precision is required for this kind of work. That second movement sounds to me like some kind of aural soundboard, upon which the violin's voice is a means to explore tonal colors within the orchestra. If you don't know this piece, you may have guessed that it's not the kind of piece with melodies that you will whistle on your way home. It's punctuated with those Bartók pizzicati, it has pitch-bending quarter-tones, sudden bursts of noise, melody and non-melody. "What a funky plucky puzzle," I wrote in my notes while listening to the second movement. It changes, slips away. Antal's performance was technically solid and full of insight, and I mean no insult when I say that I hope to hear him play this piece in 10 years as well, because I think this piece will age with him like fine wine – or a fine violin made with the best kind of wood. 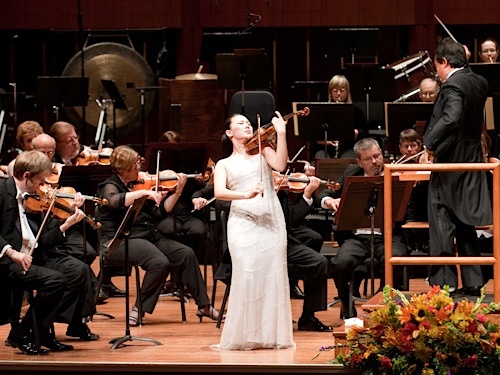 Clara-Jumi Kang's Beethoven Concerto was nothing short of stunning. At first, when she appeared in her beautiful white dress, I wondered if it was the same dress worn last night by Soyoung Yoon! It wasn't, but no matter. The white and the elegance fit with Beethoven, whose concerto demands the same kind of purity that Mozart concerti demand. This concerto certainly brought out golden beauty of her sound. The first-movement cadenza was elegantly executed, with every voice clear and strong, and as the orchestra quietly entered pizzicato accompaniment after the cadenza, Clara-Jumi kept the atmosphere still and riveting. The second movement was sweet and gorgeous all the way up the line, and each piano was hair-raising, it was so soft yet present. I was happy that, because of the way this concerto is written, she had the opportunity to set her own tempo in the third movement. She set it at a good clip. Her chords had muscle but no crunch, and she kept the feeling nice and bouncy. "I'm smiling," I wrote in my notebook. She played the cadenza super-fast, about double speed, and I enjoyed the effect because one hears different things in it this way. "Just wow," is what I wrote there. Then she artfully led the orchestra back in after the cadenza – her cadenzas were a high point in an otherwise extremely beautifully and artfully played Beethoven. People immediately rose to their feet after her performance. Early readers: photos of the violinists are forthcoming. I thought the Beethoven Concerto was easily the worst overall performance I ever heard.The conducting was a complete disaster. The orchestra were on another planet and the soloist played so sharp so often on just fairly high notes I just gave up hope.I was expecting a stony silence at the end. I can`t blame my little laptop for all that. Photos by Denis Ryan Kelly, Jr. I agree more with Laurie about Clara Jumi-Kang. Not to forget that they are all under intense stress and certainly make more little mistakes than at home... (all of them are subject to this). Needless to say I will be following the careers and recordings of these two! Fantastic experience. I still prefer Emma Steele.